Early Washington Maps Hosted by Washington State University. Whether or not one is a devoted scholar of cartography, one can always marvel at the beauty, scale and just plain oddities of rare maps and their relationship to the spaces they illustrate and information they convey. From mythical sea beasts and unexplored areas to the carving up of the “New World” by colonial powers, rare maps demonstrate not only changes in geographical knowledge but change occurring in Western civilization’s conception of itself. Combining large-scale scanning techniques, ContentDM JPEG 2000 software, and scholarly research on each map’s creation and context, this database allows researchers to access over 170 color digital images of examples from the University of Washington Libraries Special Collections Division’s Rare Map Collection. Maps included date from the sixteenth to early twentieth centuries with coverage spanning: the world, Western and Eastern Hemispheres, continents, countries and cities. Of note this collection emphasizes North America, the Pacific Northwest, and exploration in this region from the seventeenth and eighteenth centuries. A number of these maps depict the fabled Northwest Passage between Asia and North America with interesting variations on Alaska’s coastline as well as apocryphal accounts of the Sea of the West and the Northwest coast. Also important are approximately 35 maps showcasing the work of eighteenth-century French cartographer, Guillaume de L'Isle. 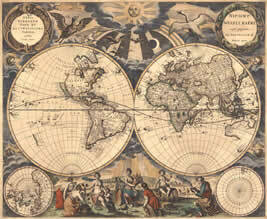 Another significant collection of maps are taken from the atlas, “Atlantis Geographicus Maior” by Matthaeus Seutter. Additionally, a small number of bird’s-eye maps depicting cities in the Pacific Northwest (i.e. Seattle, Victoria and Tacoma) are represented. This digital collection was created with the CONTENTdm software’s innovative new program, JPEG 2000 which enables larger materials to be displayed in a higher quality, more usable online format. It allows viewers to see image details that would be difficult or impossible to see at the lower resolutions used in the normal software. This new software includes pan and zoom capabilities which allow one to move in and out of the image and moving across the image to display the details. JPEG 2000 software is particularly valuable for providing access to maps and drawings since large documents are made of fine details which researchers need to be able to see clearly. The maps presented in this digital collection were scanned from original maps as TIFF files, manipulated in Adobe PhotoShop to achieve the best and clearest possible digital image and loaded into the Contentdm JPEG2000 software and linked with descriptive metadata. Selection and supervision for the Rare Map Digital Collection was done by Kristin Kinsey and the research and descriptive metadata was prepared by Sarmila C. Franklin in 2008-9. 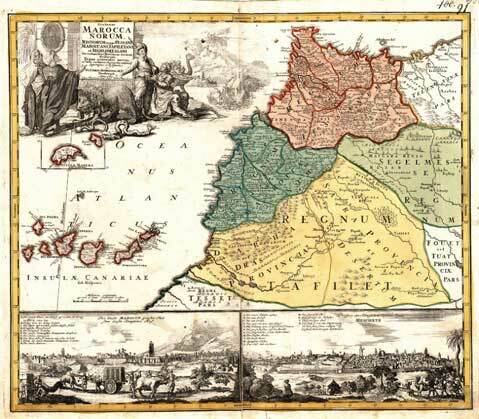 The materials in this database are selections from the Rare Map Collection held by the UW Libraries Special Collections Division. *Harley, J. B. “The Map and the Development of the History of Cartography.” In _The History of Cartography Volume 1: Cartography in Prehistoric, Ancient, and Medieval Europe and the Mediterranean_. Eds. J.B. Harley and David Woodward. Chicago: University of Chicago Press, 1987. 1-42.